So much oil, so little refining capacity. The beleaguered U.S. oil industry has been battered by a global oversupply of oil that is outpacing demand by more than 1 million barrels a day. Typically, OPEC steps in to reduce supply when this happens. This time, however, OPEC is standing firm in order to teach U.S. oil companies a lesson. To make matters worse, American oil companies face a new threat, this time from within. A labor dispute between oil refineries and union workers is leading to more employees walking off the job. This has the potential to shut down some of America's already constrained refining capacity at a time when oil companies need the industry to run at full capacity to process the growing glut of crude. ExxonMobil refinery in Illinois. Photo credit: Flickr user afromusing. The United Steelworkers union expanded its strike over the past week to a total of 12 U.S. oil refineries. The steelworkers are said to be seeking protections for worker safety and fatigue, while the refineries say it's all about the union's desire to replace routine maintenance personnel with unionized workers. The lead negotiator for the refiners, Royal Dutch Shell (NYSE:RDS-A)(NYSE:RDS-B) has made more than a half dozen offers that have all been rejected. Workers are now striking at facilities that account for 19% of the U.S. gas-making capability in one of the largest U.S. refining strikes since 1980. The union in total represents workers at 63 of the nation's refineries, which account for two-thirds of domestic refining capacity. So far, the impacted refineries have largely remained operational, but if the strike expands to additional refineries some capacity could be restricted if plants need to close. 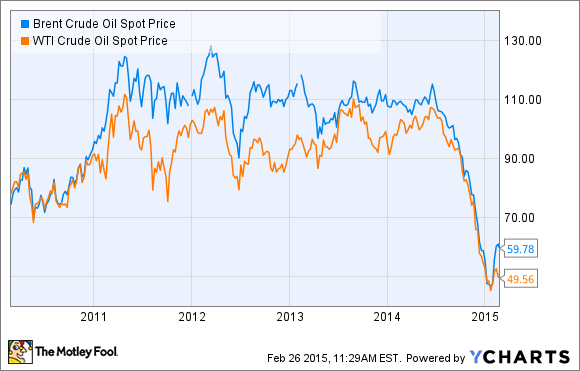 That's bad news for oil companies, refiners, and consumers. We saw the potential impact shortly when workers walked off the job at a Tesoro (NYSE:ANDV) refinery in California in early February. It had to be completely shut down, as opposed to keeping part of plant going while routine maintenance was performed. Not long afterward, an explosion forced an ExxonMobil (NYSE:XOM) refinery in California to shut down, too. Those two events knocked off 16.5% of the state's refining capacity. Not only did that worry oil companies, which had to make contingency plans for their oil, but it also caused gas prices in the state to spike by $0.53 to $2.96 per gallon, which is hurting consumers. That scenario could spread across the country if more refineries are shut down due to the strike or other unplanned outages. It could cause an uncommon phenomenon in which the price of oil in the U.S. plunges while the price of gasoline spikes. This comes at a time when the refining industry is already running short of capacity. Even before U.S. refinery workers began striking, there was growing concern that the nation wouldn't have enough refining capacity for all the oil it is producing. That's because the type of oil being produced from shale plays is light oil. The problem here is that many domestic refineries are built to handle heavier oil such as that produced from Canada's oil sands or in Venezuela. The large amount of light oil battling for a limited supply of refining capacity has caused oil produced in the U.S., West Texas Intermediate, to sell at a sizable discount to the global oil benchmark, Brent, as shown on the following chart. Note that Brent now trades for a $10 per barrel premium to WTI. That means oil producers outside the U.S., such as the OPEC nations, are earning 20% more per barrel than U.S. oil companies. Suffice it to say the pricing disconnect could really get out of control if a few refineries go offline due to the strike. This capacity issue is the main reason why U.S. oil companies are pushing so hard to have the 1970s-era crude oil export ban lifted. Their view is that the oil market needs more flexibility, and that will only come if the country can export its light oil and replace it with the heavier oil that refineries are equipped to handle. Until that happens, U.S. crude could continue to trade at a big discount to the global benchmark. That's actually twice as bad for the U.S. economy because gas prices are based on the global crude benchmark rather than domestic prices, meaning consumers are paying more than necessary at the pump while U.S. oil companies suffer from selling their oil at a discount. If the growing refining strike begins to take capacity offline it would be bad news for the economy. First, it would force American consumers to pay an unnecessary premium at the pump. It would also cost refiners a lot of money, hurting their stockholders. Finally, it could cause the price of petroleum to plunge, which might be a death blow for some smaller oil companies. That's why one the greatest threats facing oil companies in the United States today isn't the price war with OPEC, but the war within as America's limited capacity could be pushed to the brink.